Extra hours working on your short game will always payoff in lower scores. Pro golfer Arnold Palmer once said, “I have a tip that can take five strokes off anyone’s golf game: it’s called an eraser.” You may find your golf game at times relaxing, frustrating or challenging. True success in the game hinges on a little bit of skill and a lot of knowledge. Take golf tips from seasoned veterans and practice until your game becomes the envy of your group. Understanding proper golf etiquette can mean the difference between you finishing 18 holes or being asked to leave the course. The United States Golf Association requires good sportsmanship, safe playing on the course, having consideration for other players, keeping up the pace of play and respecting the course. This means taking care of bunkers, fixing your divots, turning off cell phones, keeping golf bags off the putting greens, being ready to play or allowing the group behind you to play through and ensuring that the path is clear before playing your ball. Improve your chipping game by learning accurate distances. Author and golf instructor Marshall Smith recommends laying bricks down to mark 30, 60 and 90 yards. Practice your chip shot, trying to land the ball as close to the 30-yard marker as possible. Once you are able to do that with regularity, move onto the 60- and 90-yard markers. A chronic slice is usually the result of pulling the club behind you and inside during the backswing. Correct this problem by practicing your swing with a broom. Hold the broom with the head parallel to you, and practice swinging through. As long as you keep the broom head parallel to you, you should fee no air resistance and are performing the proper swing. If you feel resistance to the air, then you have turned the broom head, indicating that your swing is off-plane. Practice this technique for five minutes a day and you will soon be playing golf slice-free. The grip you take on your club can make or break your swing. To be sure you have the right grip, take your stance, leaving the golf club behind. With palms flat, bring your hands together so that your palms are parallel. 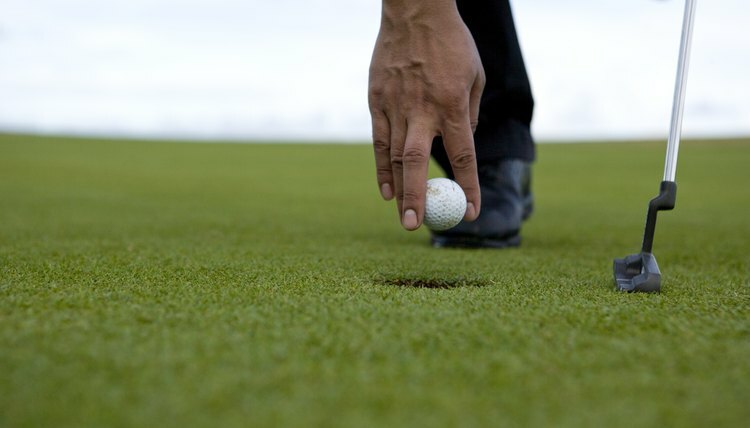 Once you have a feel for that position, grab your club, assume your normal grip and then straighten out your fingers. If your hands are not parallel, move them back into that position and try to grip the club again. How Far Should One Stand from a Golf Ball?